There are some food combinations that just work - think peanut butter and chocolate, tomato and basil, lemon and blueberries to name just a few. Well, you can now officially add sage, apple and maple syrup to that list. This isn't my invention, though. Credit must go to Helen from Casa Costello, whose blog I was assigned for this month's Secret Recipe Club. Helen had my blog back in May and made my Thumbprint cookies, and I remember then flicking through her recipes and looking forward to getting her blog sometime. Helen is from the UK and mum to 3 girls. She is a self-described 'massive foodie' and has been working with food and cakes since she was since 16. Speaking of cakes, Helen is also a fantastic cake decorator and shares lots of her creations on her #BakeoftheWeek challenge. My boys particularly liked this Police Car Cake. Gorgeous isn't it? When it came to choosing a recipe I took ages to decide, but I knew I wanted something pretty simple and of course, it had to be gluten and dairy free (or easy to convert). I loved the sound of Helen's Walnut and honey granola and Scrambled eggs with style. And this Lemon Frangipane Pie looks fabulous. 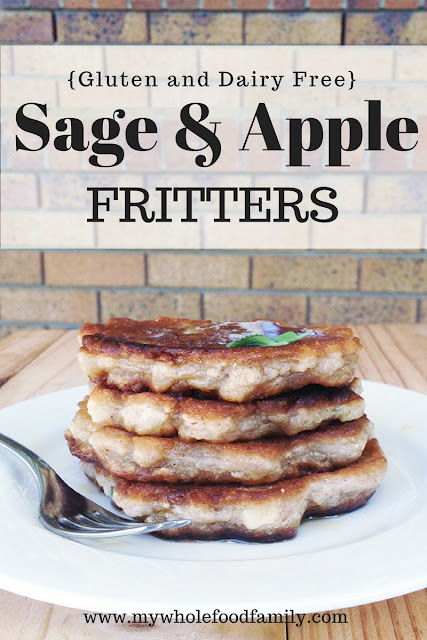 In the end though these Apple fritters with sage were calling my name. I've never used sage in this way before. Typically I only use it in stuffing at Christmas time. Which probably explains why it was so hard to find at the shops right now, no one else uses it much either! My husband eventually found a little pot of sage that Mr 7 immediately took outside and replanted into a bigger pot. It's still very young but we got enough off it for this recipe and 2 perfect little leaves for garnish. I've always loved fritters, especially tuna and corn fritters, but the rest of family doesn't share my same level of enthusiasm. That may have changed with this recipe! 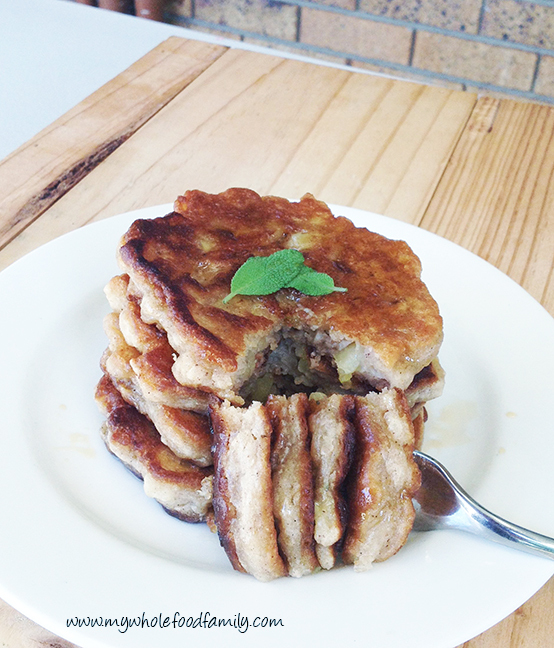 Apple, sage and maple syrup are a match made in heaven. I made only a few changes to the recipe to suit our way of eating - using gluten free flour, non-dairy milk and frying in coconut oil. I also reduced the sugar and am glad I did because between the apples and maple syrup I found them very sweet! All 3 of my boys loved these and were literally licking their plates clean. Mr fussy-5 even ate an extra sage leaf (covered with maple syrup) and declared it 'really yummy.' So huge for him to eat something green voluntarily even if he did have to smother it in syrup! These would be perfect for a weekend brunch and will definitely be on the menu at our place again. In a medium bowl whisk together the flour, baking powder, salt, cinnamon and sugar. 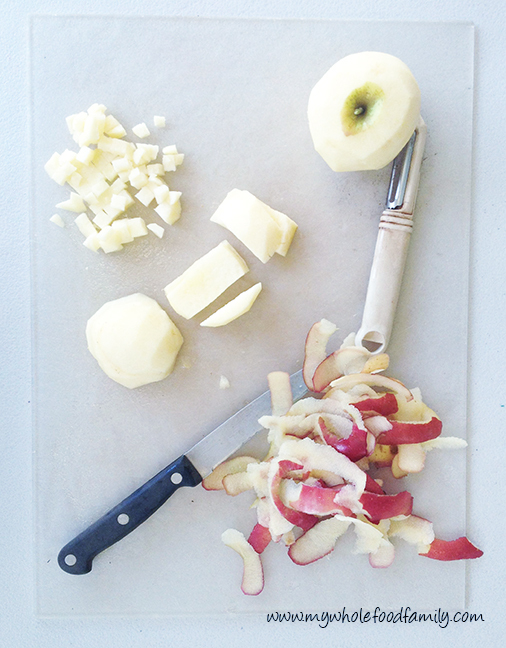 Peel the apples and chop into very small pieces. Add them to the dry ingredients and toss to combine. In a small jug beat together the milk and egg together then pour into the flour and apples and mix well. Finely chop the sage leaves and stir through. Melt 2 tablespoons of coconut oil in a large heavy-based frypan over medium heat. Dollop in spoonfuls of mixture and flatten out into pancake shapes. Cook until gold brown then flip and cook on the other side until cooked through. Remove and place on a rack while you cook the remaining fritters. Serve with a drizzle of maple syrup. Thanks for a great recipe Helen! I will definitely be making these again. These are so great Susan, what a fun choice for the SRC. You've now got me craving apple fritters, especially with sage leaves dipped in maple syrup! Your little one and I have a lot in common, LOL! My husband's grandmother used to make such apple fritters (but without the sage). I haven't had any in years, I really should make them myself sometime, they are so good. I love this fall flavor combination! These look really delicious. 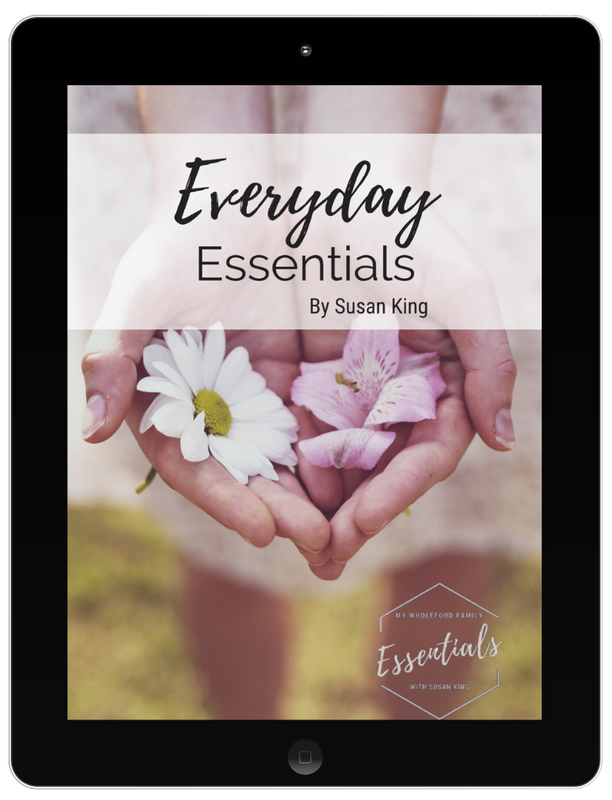 I enjoyed having your blog this month for SRC! Oh these look really good and the perfect way to start the day! Great SRC recipe! These look great. I love the sage! I love the flavor of sage in different dishes. Nice choice for SRC! Have never had apple fritters before, these look delicious! Love all the autumn flavors! Such a great pick for the season. I think apple and sage work quite well together. Love the addition of maple syrup!